There are wild places in New England, and settled areas, but rare are the locations where the two are as closely nestled together as at the Blackstone Gorge in Blackstone, MA. One must drive through a densely settled neighborhood before reaching the large, well-marked parking lot next to the spillway at the Gorge. The contrast of civilization next to apparent wilderness never ceases to surprise me. At the Gorge, the river cascades over the dam, then through a jumble of rocks that brings to mind mountainous streams north of here. In spring there is a constant roar as the water rushes through the narrow passageway, heading to the sea. The rocky, unmarked, well-worn path beside the river is challenging, and populated by numerous varieties of plants that grow along the river—hemlock, witch hazel, rhododendron, and ferns. The walkway slowly climbs upward, ultimately reaching to 80 feet above the river. The steep cliffs of the Gorge offer scenes of spectacular beauty in the summer. Winter walks offer still different views as ice coats the rocks of the gorge, creating surprising patterns among the boulders in the water. Most of the 250-acre park is located in Rhode Island. The entrance, however, is in Blackstone. Children (and some adults, truth to tell) enjoy looking for the large granite marker quite near the river’s edge that marks the boundary between Blackstone and N. Smithfield, RI. The ground all around the marker is well-worn by people who have enjoyed the novelty of standing in two states at once. The dam creates a quiet section of river behind it, populated by numerous birds, and ideal for a leisurely paddle upstream. The river can be accessed by a boat ramp just above the dam. Be aware, however, that the gate to the boat ramp is blocked off, so you must haul your canoe or kayak to the water’s edge. The barrels warning of the dam’s presence are sometimes dislodged by floodwaters, so one must use care when returning to the boat ramp—it is quite near the edge of the dam. Leashed dogs are welcome at the Gorge. There are no bathroom facilities. 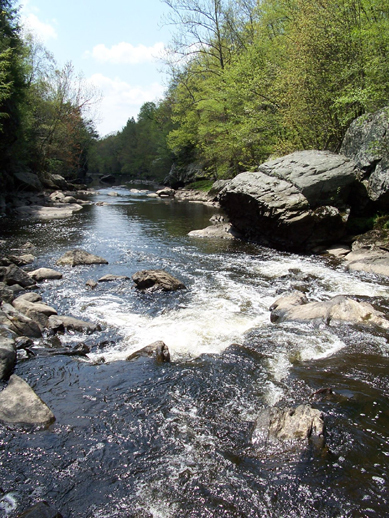 The Blackstone Gorge, part of the Blackstone River Heritage Corridor, is open from dawn to dusk. Directions: From Bellingham Center, head south on Rt. 126 to the light at Elm Street (beyond the light at Charlie’s Tire). Turn right and follow Elm Street into Blackstone. At the first fork, bear left onto Summer Street, bear right at the next fork, which is still Summer Street. Continue past the stop sign at Farm Street, then take the next left onto Federal Street. Federal Street ends at Rt. 122. Turn right onto 122, go through Blackstone Center, and look for the brown sign indicating Blackstone Gorge, at County Street, on the left. Follow County Street to the end; the Gorge parking lot is on the left.